"Of the past and the present, old and new heroes unite." It has been ten years since the War of the Lands. A former hero of the war, Henry Randolph, found himself accused of a crime he did not commit. After living on the run for the past ten years, Henry returns to his home country to set off on a new journey. Meanwhile, Sorin Wilk has been living a simple life. This all changed one day when his long, lost father Kirk shows up to drop a bombshell: that he has an older brother who is still alive and is somewhere on the other side of the world. The two join along with a promising young inventor, Gale, and one of Kirk's old friends, Eva, to travel to the other side. In addition, other characters join along, too. Gavin, a lieutenant who tends to take himself too seriously, searches for his estranged brother Law while also trying to arrest Henry Randolph as well. On the other side, Law meets with a young woman, Mina, who possesses amazing strength, and Ayanna, a star major for the country's military. Along the way, the heroes run into familiar friends and fiendish foes. It will be up to them as to how they will deal with these foes. One thing is for certain, though: these heroes will never give up. Brave Fighting Sun - Brave Fighting Sun has not been tagged yet. Help others find Brave Fighting Sun - Brave Fighting Sun by tagging it! 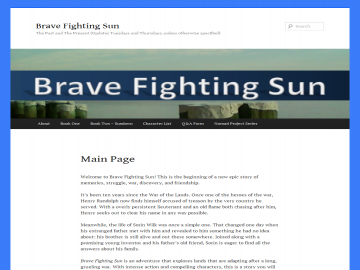 Brave Fighting Sun - Brave Fighting Sun has not been reviewed yet. Brave Fighting Sun - Brave Fighting Sun has not been recommended yet.